His playing style has always been reminiscent of that of Charles Earland, both driving bass line and magnificent right hand, always keeping the tune rolling and grooving. He is also an enthusiastic music listener, especially keen on funky/soulful/groovy sides, from Be-Bop Jazz, soulful Organ Jazz, James Brown and other funk music, Stax Soul, Philly Soul, etc. Yes, he has the ultimate passion for “the groove” both on playing and listening. He also has a strong passion to educate many musicians on playing groovy music, as well as the long and diverse history of such. He knew there were so many talented but “unknown” players all around in Japan, but he also knew few of them understand how to “groove”, how to “listen” to co-players and respond, how the history of soulful/gospel/funky music had been evolved. This could be one reason he wanted to have his own bar with a stage, welcoming any players to jam with him, educating them how to groove with his own sound. Honestly, the quality of the jam sessions at Eddie’s Lounge is very uneven – ranging from very amateur and loose, to very professional and grooving altogether. But this is one of the good points about Eddie’s Lounge. Everybody who wants to join the soulful jam is always welcome, and you can even learn how to play the groove in action with Eddie. The atmosphere is very warm and cheerful – it may be Eddie’s sensitivity and personality. Eddie Landsberg (1971-, b. Philadelphia, PA), now living in the Tokyo area, Japan, has been a good friend of mine since October 2003. I remember he firstly e-mailed me that he found my website, expressing how much he was into soulful/groovy music (like I love too), and he asked me to visit the gig at Burglar, Nishi-Azabu, Tokyo. The below web article on Tokyo Weekender was published at around when Eddie and I met for the first time. After I met him for the first time at Burglar in October 2003, I could take part in the grand opening day of his first Eddie’s Lounge in Kita-Senju on November 26, 2003 – a tiny bar, but full of excitements and hot atmosphere were always there. 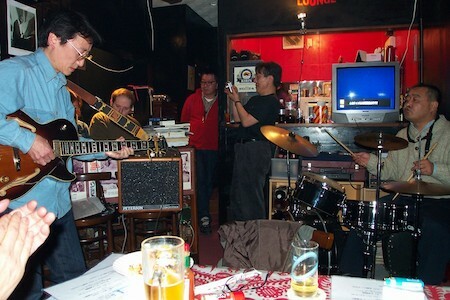 I visited to the Lounge again on February 28, 2004 with a friend of mine who wanted to join the jam session there. The whole atmosphere in the lounge was real nice. Then for some reasons he had faced, he decided to close the bar. But he was back on stage in 2009. 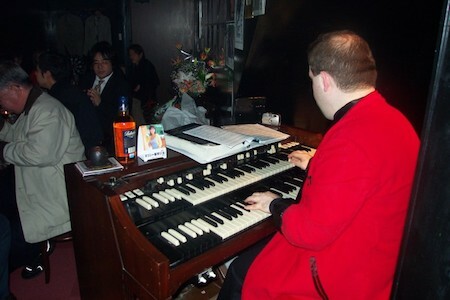 I was there at the Organ Jazz Club, Numabukuro, Eddie playing Hammond B3 with Kyohei Yamamoto and Kazumasa Oyamada. This trio was really groovy and funky, and I believe Eddie surely enjoyed the performance on the day. It was really awesome. On July 5, 2009, I took my daughter (who was only one year old then) to the Organ Jazz Club again, to listen to the trio. Again, the band sounded very tight and right. She also enjoyed the performance for sure. 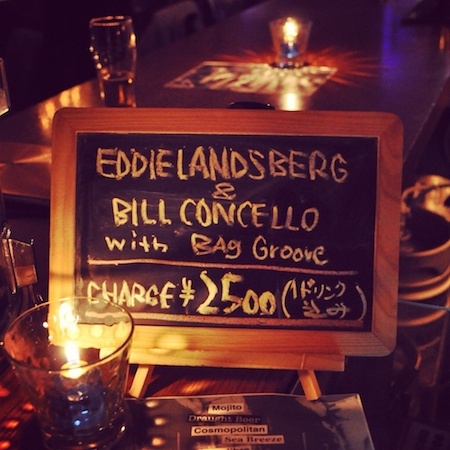 On November 10, 2012, I was at The Juke Joint, Nishi-Azabu to watch Eddie Landsberg on stage with Bill Concello. I saw Eddie fully enjoy the moment with the great drummer. I was also happy to be there. And ten years after the first Eddie’s Lounge opened, he finally made up his mind to open Eddie’s Lounge again, this time located in Nishi-Nippori (five minutes walk from the Nishi-Nippori station). Not only a great place to appreciate soulful BGM (I once did DJ there – haha), not only a good place to join the jam, but also Eddie’s Lounge is a very good Izakaya – many variety of Shochu at 500 YEN, Motsu-Nabe at 900 YEN. Many other dishes are also at good price, and all are simply delicious (he cooks by himself). Eddie’s Lounge is a good Izakaya with tasty dishes at good price, and it’s more than that – a soulful and groovin’ Izakaya! I’ll say this again: if you like soulful music and groovy jazz, you gotta go to the Eddie’s Lounge now. Also, if you are professional/amateur musician and you want a place to join the jam, Eddie’s Lounge is one of the best places to dig in Tokyo. Please do me a favor, from a friend of him – be sure to follow Mr. Eddie Landsberg on Twitter, Facebook. “Eddie’s Lounge” has its own Facebook page too. and tagged Eddie Landsberg, Eddie's Lounge, Hammond B3, Jazz, Soul.